These CDs preserve all the music that was played in four concerts that Arturo Toscanini gave with the BBC Symphony Orchestra in June 1935. As Christopher Dyment relates in his detailed and fascinating booklet notes, this was not the Maestro’s first London appearance but hitherto he had never conducted an indigenous orchestra due to the questionable quality of British orchestras. The formation of the BBC Symphony Orchestra in 1930 quickly changed perceptions and several leading conductors conducted the new orchestra with great success within a couple of years of its foundation. A concerto appearance with the orchestra in 1934 by Toscanini’s son-in-law, Horowitz, seems to have sealed the deal and the Maestro duly arrived in 1935 for four concerts - with no less than twenty rehearsals. The BBC has been much criticised in recent years for paying vast salaries to presenters and so-called celebrities so it’s interesting to note that back in 1935 Toscanini was paid a fee of £500 per concert, which apparently equates to £27,000 or $40,000 today: even then stars commanded a premium! All four concerts were broadcast by the BBC but recording them for commercial release was a very different matter. HMV, led by Fred Gaisberg, were desperate to record the concerts, Mr Dyment details the lengthy, tortuous negotiations between HMV and Toscanini and his representatives over recording. The Maestro eventually consented just before the second concert - the first concert, on June 3, was recorded secretly in the hope that permission would be forthcoming. However, all subsequent efforts to get Toscanini to hear and approve the recordings for release were unsuccessful with the result that the masters languished in the EMI vaults for decades. Most, if not all, of the recordings were eventually issued but so far as I’m aware this is the first time that they’ve been assembled as a set dedicated just to the 1935 concerts. Toscanini selected for these concerts repertoire that played to many of his particular strengths - Brahms, Wagner and Beethoven were all included. These discs include many magnificent performances but even among all this excellence two readings stand out, I think. The Brahms Fourth Symphony is given a towering performance. Christopher Dyment points out the influence of Fritz Steinbach, not least in respect of the flexibility of tempo. I was struck by the way in which Toscanini minutely and expressively shapes the Andante moderato, which he takes at quite a measured pace. 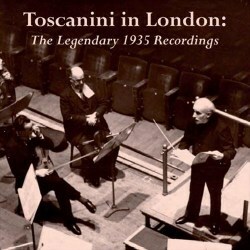 The music is moulded from bar to bar yet at the same time Toscanini achieves a seamless flow. The Allegro giocoso is vitally energetic and the performance is crowned by a tremendously powerful and penetrating account of the great passacaglia finale. The other exceptional performance is that of La Mer, which EMI issued some years ago in their Great Recordings of the Century series, coupled with the 1935 ‘Enigma’ Variations. This work has become such a staple of the repertoire that it’s something of a surprise to recall that this Toscanini performance took place only thirty years after it was unveiled to the public; so in 1935 one might say it could still be regarded as ‘contemporary music’. Toscanini’s interpretation is simply riveting and I was amazed by how much internal detail comes through; that’s a tribute to the conductor and to Fred Gaisberg and his team. By any standards this is a great performance and the BBC Symphony Orchestra acquits itself admirably. Toscanini gets so much light and shade into the music and so much flow. I found that I really got a sense not just of surface waves and ripples but also of eddying currents under the surface, especially in the second movement, ‘Jeux de vagues’. There’s real turbulence in ‘Dialogue du vent et de la mer’, which Toscanini makes positively elemental. It’s fascinating to hear the Maestro in Elgar. I believe London had already heard him in this work during his 1930 visit with the New York Philharmonic. He leads a well-characterised account of the ‘Enigma’ Variations. ‘Troyte’ and ‘G.R.S’ are tossed off with fire and flair - perhaps too much so for some tastes but it’s exhilarating. I like the way ‘Nimrod’ flows - Toscanini plays it as a tribute, not an elegy - though he rather spoils it for me by a grandiose slowing for the final climax (2:35). ‘Dorabella’ is invested with lightness and grace but Toscanini doesn’t introduce the shy little hesitations that are such an endearing feature of this miniature portrait. The finale has a fine sweep to it; Toscanini plays the music with thrust and, at times, genuine grandeur and it’s no surprise that the London audience accorded him a vociferous ovation. Some of the Wagner is very special. Siegfried’s Death and Funeral Music is intense and nobly tragic. Toscanini generates tremendous power in the Funeral Music; you can sense his magnetism. The BBCSO play as if their lives depended on it but, sadly, there’s immediate applause as the music expires. The Act I Prelude to Parsifal is, if anything, finer still. The music has a spiritual intensity and even 78 years later the visionary way in which Toscanini communicates this music still enthrals. I enjoyed the ‘Haffner’ Symphony. I had wondered if it might be hard-driven but such is not the case. Indeed, the Menuetto is particularly winning. The minuet has a sturdy grace and the way Toscanini eases into the trio is delectable while the phrases of the trio itself are almost caressed. Elsewhere, the Andante is graceful and the finale is done with real brio; the BBC strings articulate the notes wonderfully. Beethoven’s Seventh generally comes off well. The loud chords at the start of the Introduction are very sec, indeed brusque, and I feared this might presage a tough reading. However, I don’t believe it is, though it’s certainly purposeful. The Introduction is taut, the harbinger of a highly charged Vivace. The Scherzo is explosive - in the right way - and Toscanini doesn’t dawdle in the trio. The finale flashes and blazes but the music is always disciplined; Aubrey Brain and the BBC horn section play exultantly. Brain is heard to even better advantage in the Nocturne from A Midsummer Night’s Dream. This is quite beautifully done, Toscanini phrasing the music warmly. The Scherzo that follows is gossamer light. What a shame that Mendelssohn’s wonderful Overture didn’t feature in these programmes. Besides all the music that was heard in these four remarkable concerts, WHRA offers us a bonus in the shape of one of the Beethoven recordings that Toscanini recorded with the BBC orchestra under studio conditions in 1939. I don’t know what the source materials for these recordings are - WHRA acknowledges Gene Pollioni for the loan of “rare source material”. However, these new (2012) transfers by Gene Gaudette seem to me to be very successful. Surface noise is absent so far as I could tell and though the recordings have inevitable limitations - as you’d expect given the age of the original recordings and the demanding conditions under which Gaisberg and his colleagues must have worked - it’s amazing how well the performances come across and how much detail can be heard. I can honestly say that in no way was my appreciation and enjoyment of these remarkable performances inhibited by the sound. I’ve been able to do a limited amount of comparison. In 1999 BBC Legends issued Toscanini’s 1939 BBC recording of Beethoven’s Missa Solemnis (BBCL 4016-2). The two-disc set also included the performances of the ‘Haffner’ Symphony and the Cherubini overture that are included in this WHRA set. There’s also the 1935 Beethoven Seventh Symphony. However, this was given twice in this concert series - on 12 and 14 June - and the BBC Legends set includes the former performance while WHRA have the second one. The BBC Legends transfer of the Mozart is a good one; the sound is rather brighter than on the WHRA set, which some listeners may prefer, but there’s quite noticeable hiss which WHRA have eliminated. WHRA achieve far more presence in their Cherubini transfer, which is a clear winner in my view. As with the Mozart, there’s hiss on the Legends transfer of the Beethoven. This WHRA set is a splendid one. The sound quality is good while the documentation is fully up to the label’s usually high standards. As for the music-making, well the quality of that is quite exceptional. And remember, this is Toscanini working as a guest with a relatively young orchestra with which he’d not previously worked. Even on twenty rehearsals the results are remarkable. Adrian Boult must have been thrilled to hear the orchestra that he’d created and trained give such a fine account of itself; no wonder Toscanini was willing to come back to conduct them again. This set will be self-recommending to all acolytes of the Maestro who don’t already possess all these performances but it should also be snapped up by all who value great conducting.